This is not the same as, nor a substitute for, M03 Modern US Navy Haze Gray. The Snyder-Short chip labelled as "#27 neutral haze gray" erroneously shows Modern US Navy Haze Gray. I need to politely ask that you do not take it upon yourself reassign our product codes to different names. I have read your argument but can't change Colourcoats based upon it without conducting a a proper research programme of my own with clear references and repeatable methodologies. I have however had a few confused potential customers now contact me, the latest one pointing me to this thread - wanting to know why they are reading about US28's name reassigned to US32. As others will attest to, I am quite open to challenge, but arguments like these may confuse my customers reading back for years to come because they are drawn out and usually inconclusive or misunderstood by readers. As such, I would kindly ask that that argument does not involve Colourcoats product codes or naming on a public forum. For the avoidance of any doubt from wider readership, as of December 2017 Colourcoats US Navy paints are all matched to Snyder & Short. I hope you understand my reasons for distancing our products from the unofficial "reassignments" you've suggested for them on this forum. Michael,USS MISSOURI was painted in her dazzle (USS Missouri (BB-63) used Design 22D in Measure 32 colors of dull black (DK), ocean gray (5-O) and light gray (5-L)) on the East Coast in mid-1944 well before Neutral Paint. Then she was repainted into Ms 22 before heading to the War Zone ... in November-December 1944 ... not enough time for her to have gotten the new paint. Bump to an old thread but with new old documentation! I've recently updated my camouflage page with some new documents I found on a past research trip. A little background to make it easier to follow what I'm about to summarize. Bureau of Ships in Washington DC was in charge of setting policy and direction, but they did not develop or manufacture paint. Paint formulas had been developed and tested by the Philadelphia Navy Yard (PNY) since before the war. They presumably had equipment to manufacture some paint, but they weren't an official paint manufacturing yard for distribution. Mare Island and Norfolk Navy Yards (MINY and NNY respectively) were the exclusive paint paint sources at the start of the war, but by 1943 demand outstripped their ability to fully furnish needed quantities and some of the formulas had been inadvertently leaked to civilian paint manufacturing companies, and the decision was made to simply open it up and let them provide paint as well as MINY and NNY. It was not completely outsourced, however, and the two yards continued to provide significant quantities of paint to the fleets in their respective oceans. So, in late June BuShips orders PNY to develop new paints using only black and white paints (i.e. neutral and not purple blue-based such as the paints that had been in use since the start of the war). The paints are not named or designated, but a follow-up letter back to BuShips a week later does, and references the initial letter, so we know that they are talking about (among other things) what will eventually be two of the "1945 neutrals." One of them is #17 (Ocean) gray. Note that the date on the first memo is June 22 - Missouri was commissioned in dazzle paint on June 11, before the neutrals were ordered to be created. I guess it is unambiguous that a ship was painted in colors before they were even created. This response also includes the route slip in the Bureau of Ships camouflage files that was attached to the document. Note that there is an erased note (I tried to make it out but could not) on July 4th, then we jump forward to September where there is discussion of the question of gloss that PNY sent. We don't know that this actually indicates a delay of two months before work started, but I don't find it likely. However, the next batch of documents is in November and it indicates that the paint formulas have not been finished. Philadelphia Navy Yard proposes a formula for #37 Light Gray on November 15 which is then approved a week later. In between this, Norfolk Navy Yard sends paint samples to PNY and requests paint chips from them. This memo indicates that Norfolk Navy Yard has started manufacturing the new paints, but Missouri had left a couple of days later for the west coast. It should also be noted that a memo sent to MINY and NNY the same day that #37 Light Gray was approved refers to these formulas "as a temporary measure." I don't know the full ramifications of this statement at this point. Were there multiple neutral formulas in play? I haven't found all of the referenced documents yet. * Paragraphs 5 (a) and (b) order the issue of old mixtures and deck paint until supplies are exhausted. Missouri left the west coast for Pearl Harbor on December 18. Between her arrival on November 28 and that day she was repainted into Measure 22. Even the February 1945 instructions for painting Measure 22 states, "Apply a horizontal band of Navy Blue (5-NB) or #7 Navy Gray (5-N), if blue not available, to the hull." Note the preference for Navy Blue of Navy Gray. This ends back with my original statement that the later in 1945 and the closer to the US the more likely it is that a ship was painted in the neutrals, but there is a lot we don't know. We do know that Missouri was not painted in neutrals when she was in dazzle and she was not painted in Navy Gray when she left the west coast... and was not likely in neutrals at all at this time. In Measure 22, Navy Blue (5-NB) or #7 Navy Gray (5-N) applied to the hull in a horizontal band below the lowest point of the sheer line. That dark band is all that Tracy White's post addresses. Above the horizontal band, the ships used #27 neutral haze gray, which for a modeler is available as Colourcoats US28 and M03. Airbrushed samples of ColourCoats US28 and M03 are close to Pantone Uncoated 416U, which < https://www.e-paint.co.uk/ > rates as Light Reflectance Value of "approx. 28", close to the 27% reflectivity of USN #27 neutral haze gray. Those similarities substantiate that Colourcoats paints US28 and M03 are authentic for the actual wartime #27 neutral haze gray of 1945, in USN camouflage measure 22. Any honest person can visit a commercial print shop and verify this with your own eyes. Snyder-Short USN WW2 Ship Colors Set 1 sample of 1941 5-H haze gray matches Pantone Coated 2162C, which < https://www.e-paint.co.uk/ > rates as Light Reflectance Value of "approx. 37." Any honest person can visit a commercial print shop and verify this with your own eyes. March 1945 photos of USS Miami and USS Missouri, and USS Alaska consistently show the dark reflectance of #27 neutral haze gray above the dark hull band. Nothing in Tracy White's research contradicts that. Nothing in Tracy White's research supports that USS Missouri "was not likely in neutrals at all at this time" or that 5-H haze gray was even authorized. Nothing in Tracy White's research supports that USS Missouri "was not likely in neutrals at all at this time" or that 5-H haze gray was even authorized. Other than, "use up existing stocks,"
And I think I pretty effectively destroyed your argument that Missouri's Dazzle was neutral. Most of us would be open to the possibility of Missouri being in neutrals at the time the surrender if your methods of determination weren't so ... I'm seriously not trying to insult you here, just can't come up with what feels like a adequate "neutral" (no pun intended) description .... worthless. I will accept all the criticism for that being a horribly constructed last sentence. Great stuff, Tracy. Thanks for all the research you do! Even the February 1945 instructions for painting Measure 22 states, "Apply a horizontal band of Navy Blue (5-NB) or #7 Navy Gray (5-N), if blue not available, to the hull." Interesting that some of the ships would have the combination of the newer neutral gray and the old navy blue. That would look interesting on a model! Probably drive some IPMS judges out of their minds, too. The issue concerns ships in measure 22 in 1945. 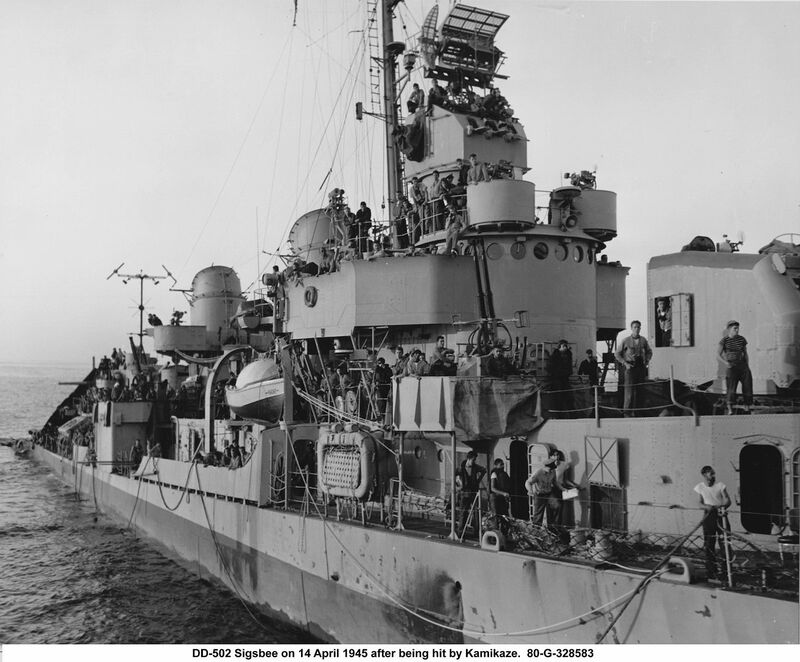 March 1945 photos of USS Miami, USS Missouri, and USS Alaska, readily available at http://www.NavSource.org, consistently show the dark reflectance of #27 neutral haze gray above the dark hull band. Nothing in Tracy White's documents contradicts that. Any honest person can compare 27%-reflectance #27 neutral haze gray with the much lighter 37%-reflectance 5-H purple gray dated 1941. I have offered Rick Davis new tins of #27 neutral haze gray and #37 neutral ocean gray, and if he wishes a ship model kit, on condition that he first announces that he will build a competent model in measure 22 with those paints and will post photographs for all to see. He declines. Tracy White wrote about himself (2/18/2018 on The SteelNavy.Com Message Board) regarding the demonstrable (to anyone else) accuracy of ColourCoats US28 to represent #27 neutral haze gray, "I haven't looked at it at all. I do not consider myself a good judge of color subtleties." On that, he and I concur, although Tracy White posts that in photographs he sees "color shifts" and "clouds," that others have monitor problems (affecting printed books), and that Steve Wiper was "cherry picking" in printing all known photographs of USS Alaska in March 1945. 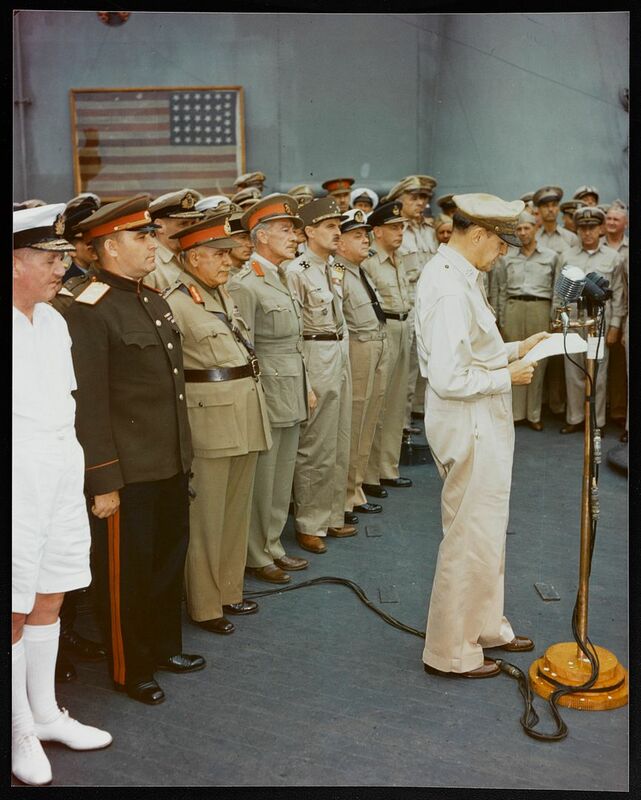 Tracy White's conjecture that USS Missouri "was not likely in neutrals at all at this time," i.e., when USS Missouri departed Hunters Point Navy Yard in December 1944, means that instead Missouri departed Hunters Point in 37%-reflectance 5-H purple gray on her upperworks. 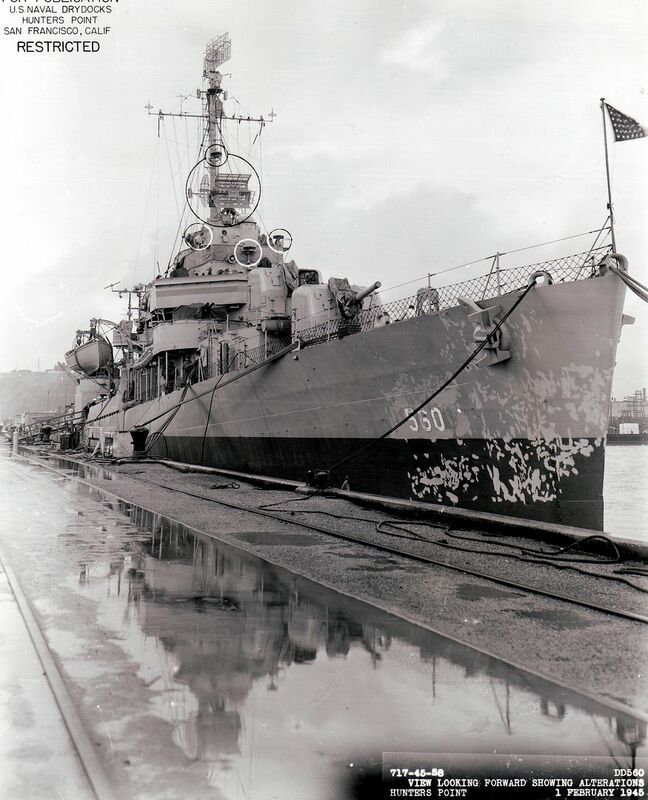 It is the case that USS Miami was repainted in theater to neutral grays by the time of her March 1945 photograph at Ulithi. Paul Stilwell, Battleship Missouri, (U.S. Naval Institute) has nothing consistent with the upper hull band and the entire superstructure and armament of Missouri being completely repainted during this time, an odd omission if that's what it is, since the book cites other instances of repainting. Where is evidence that during in the weeks between Hunters Point and her March 1945 operations, the ship was repainted in #27 neutral haze gray? The actual absence of that evidence substantiates that Tracy White's conjecture that USS Missouri "was not likely in neutrals at all at this time" is imaginary. This isn't to try and convince you that you are wrong, it is for anyone reading this thread so they don't blindly follow your logic. I have explained why your selection of which ship is painted with #27 Haze Gray is not a scientific process. You use a subjective process based on your assumption of how 5-H Haze Gray and #27 Haze Gray look in B&W images. First off and the key point is that you base your selection of what ships are painted in #27 Neutral Haze Gray largely on selecting B&W photos seen on-line as lo-rez images that are far removed from the original photos. You cherry picked images whose Haze Gray is slightly darker than other images and declare them to be painted in #27 Haze Gray. NO ONE can determine the specific color shade of a ship from a grayscale image, specifically between two shades ... 5-H Haze Gray and #27 Haze Gray ... that have the same range of contrast possible in B&W photos. B&W photos vary a lot based on the negative film type used, what negative size the image was taken on, what camera was used to take the image, what settings were used to take the image, what filters (if any) was used on the camera's optics, what the weather and lighting conditions existed when the photo was taken, what processing was done to develop the negatives, how the print was processed and paper was used, etc. With well over 99% of original prints/negatives we know next to nothing to all these variables. The range of WWII images of Ms 22 ships taken from 1942 to post-WWII, show a WIDE range of contrasts caused by the factors I listed above. The contrast range for 5-H Haze Gray and #27 Haze Gray overlap to a large extent. In the past I have posted examples and asked you to decided which paint those ships were painted and you never responded. Even color transparencies taken during WWII have their limitations. Unfortunately, a large number of the available color transparencies are today rather poor quality. Having either faded, shifted colors, or completely lost ALL color. 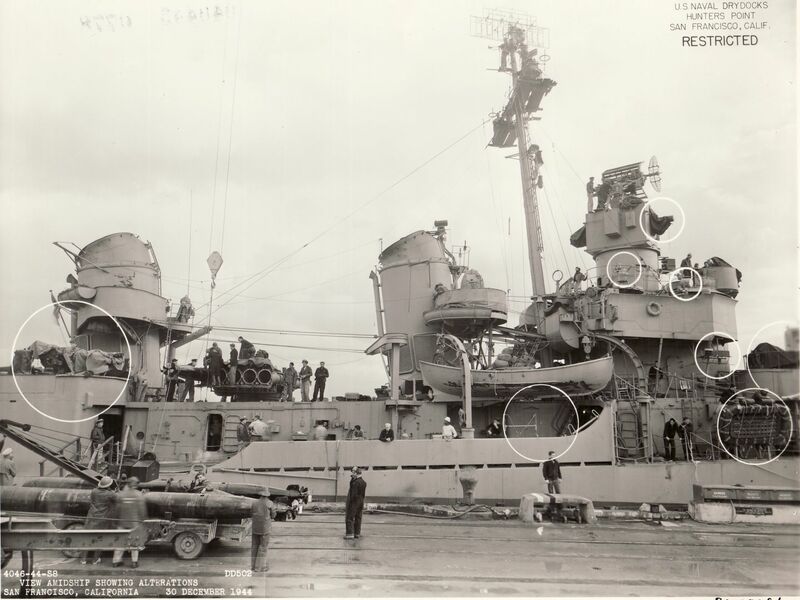 You point to images of USS MIAMI, USS MISSOURI, and USS ALASKA taken in March 1945. Of these two are B&W images and only one image, USS MIAMI (CL-89), is in color. This is a crop of the scan of the original transparency at NARA that I made. The above image was taken by a USN photographer onboard USS WEST VIRGINIA (BB-48) that took several photos at the same time frame leading up to the Okinawa Operation and on D-Day, 1 April 1945. Here are a couple of other images made in the same roughly the same two week time period. USS BULLARD (DD-660) and USS FRANKLIN (CV-13) are seen shortly after they arrived at the Ulithi anchorage just two days before TF 58 departed on 14 March 1945. This color image of USS RICHARD P. LEARY (DD-664) was taken off Okinawa beach on 1 April 1945. It is unusual to find color AND B&W photos taken of the same ship at the same time/day. 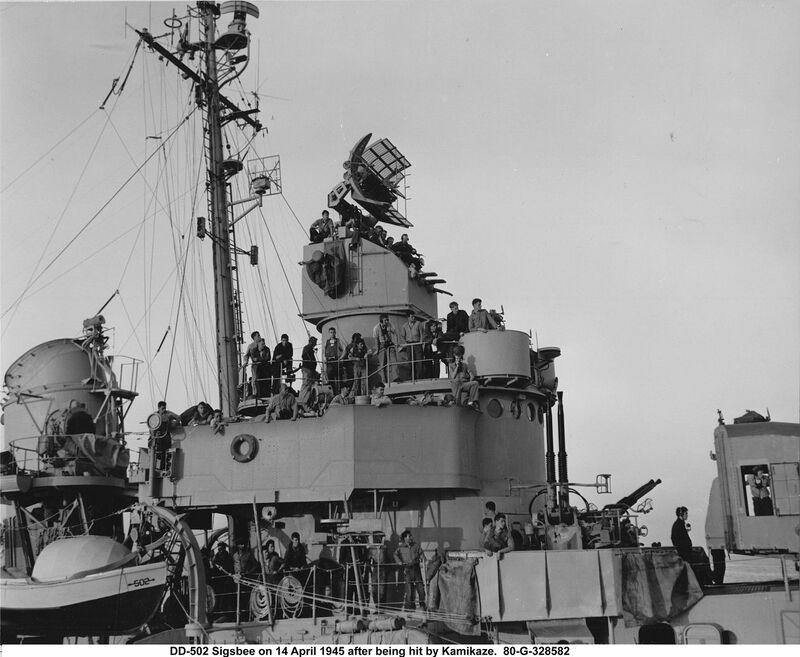 But, here are a couple of B&W images of USS RICHARD P. LEARY on 1 April 1945, also taken by a USN photographer on USS WEST VIRGINIA. 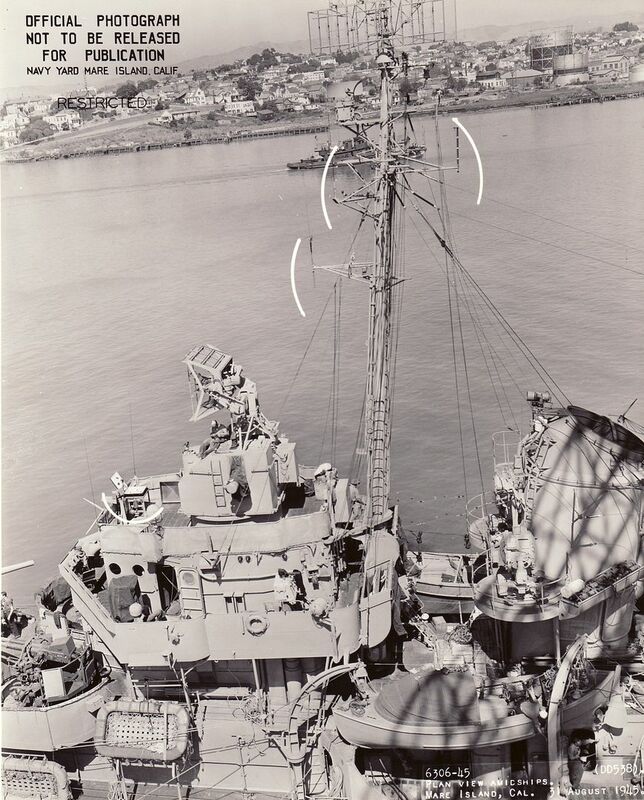 Of the three ships above, USS BULLARD (DD-660) was overhauled and repainted into MS 22 at Beth-SF private yard 19-30 January 1945, when neutral paints weren't available. 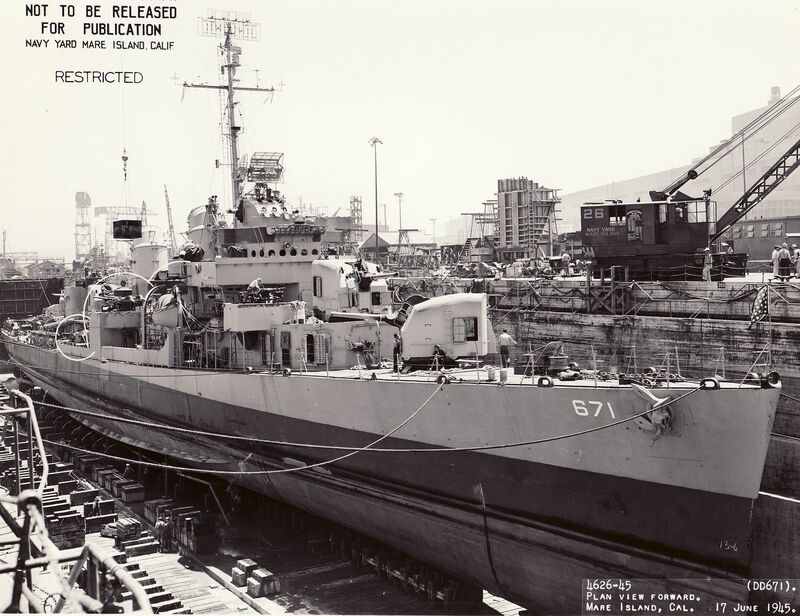 USS RICHARD P. LEARY (DD-664) was dry-docked and repainted in the Philippines during March 1945 just prior to the Okinawa operations. USS MIAMI (CL-89) was repainted out of dazzle to Ms 22 at some point prior to mid-March 1945. Maybe while her typhoon damage was repaired? 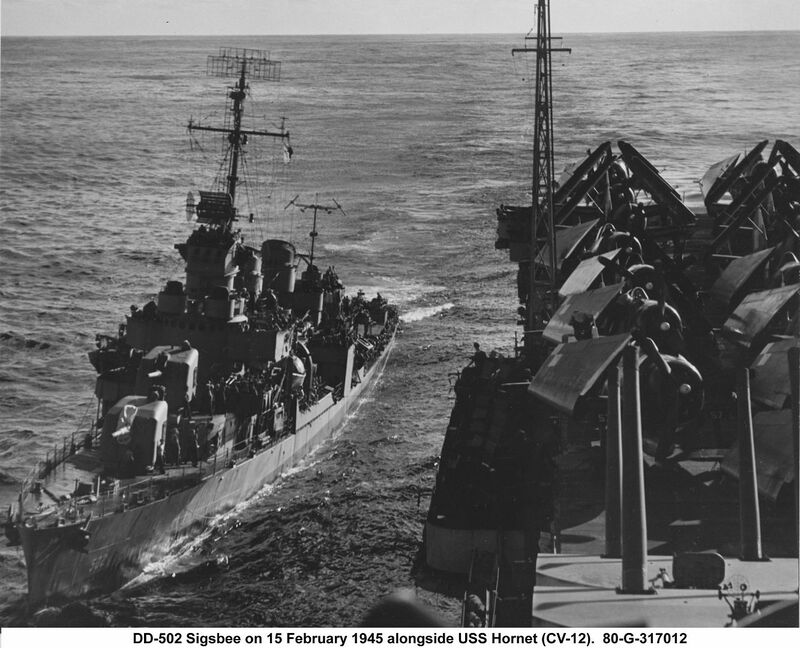 There was a rush to repaint USN ships out of dazzle to either Ms 21 or Ms 22 after the Iwo Jima operation. Which of these ships are painted using Neutral Grays?? 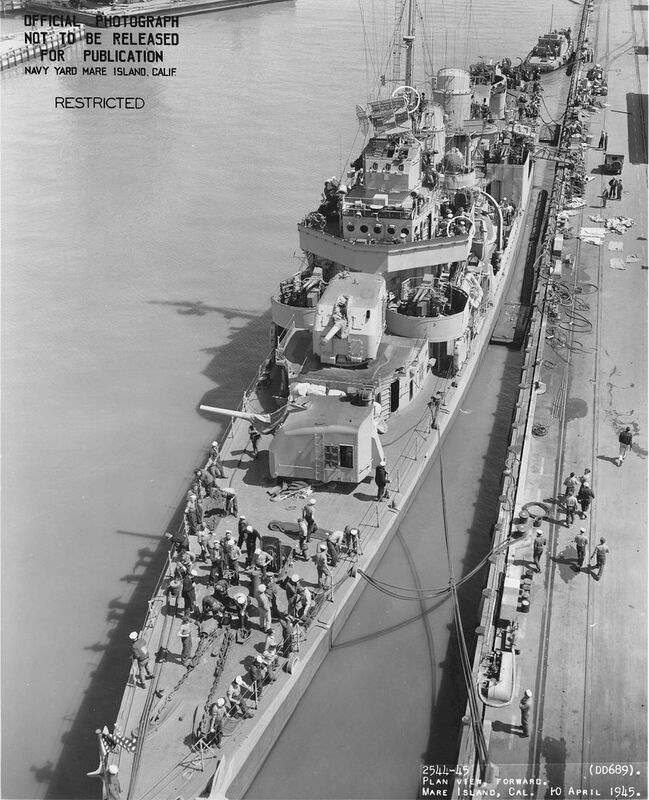 As for USS MISSOURI (BB-63), there are some B&W photos of her in March-August 1945. I'm not reposting most of these because they have been discussed before. But, the two US Army Signal Corp photos taken at the surrender are useful to compare side by side. Same camera, same photographer, same subject ... only camera settings are different. As I said above, there is no way to determine if she was painted in Neutral or the Blue-Purple paints. What is known that USS MISSOURI was painted (as was USS ALASKA) painted into Ms 22 before the neutral grays were available ... AND EXISTING SUPPLIES HAVE BEEN USED UP. It is possible that someone decided to have the ships repainted with neutrals once in the war zone, but given that NO MENTION is made that she was repainted (touched up for sure) and no period of drydocking to make this large job easier than having the crew go over the ship with paintbrushes. Below are a series of destroyer images for units repainted to Ms 22 camo scheme at various time frames during 1945 when the neutral paints were being introduced while "existing" supplies of the blue-purple paints were still available. 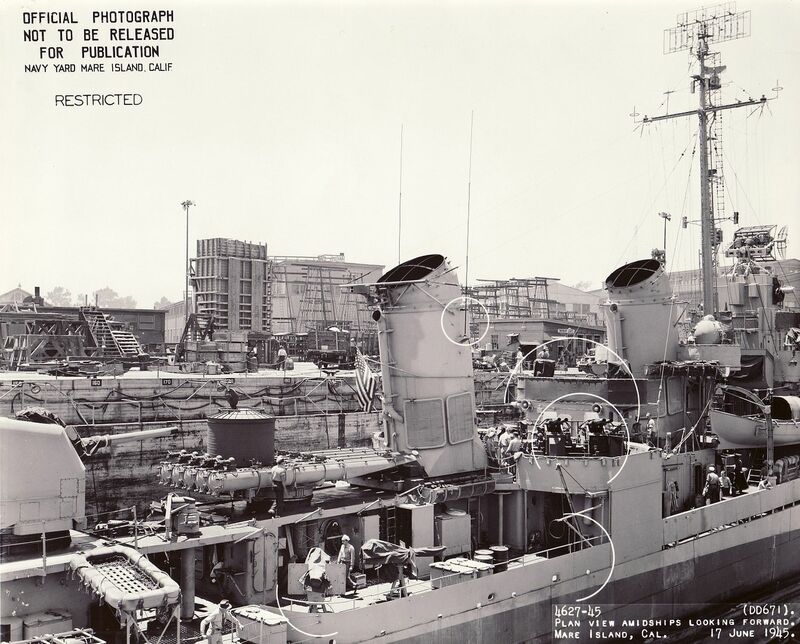 I selected these images out of over 4,000 images of FLETCHER class destroyers to illustrate the wide range of contrasts seen with Haze Gray. 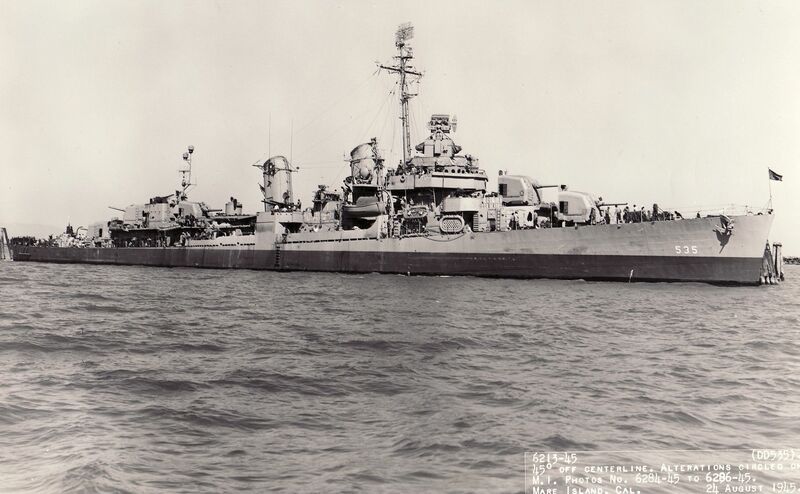 USS SIGSBEE (DD-502) from her at Maston Nav. 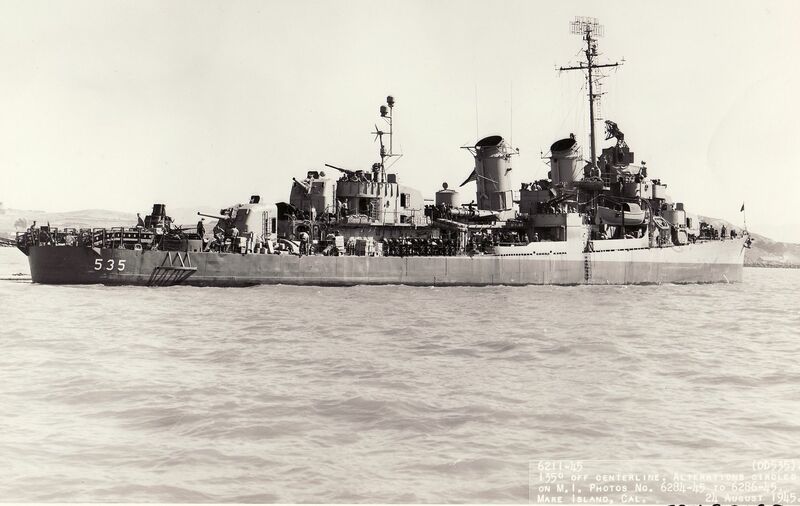 private yard on 30 December 1944 (when neutral grays were NOT available) to 14 April 1945 after she was hit by kamikazes. 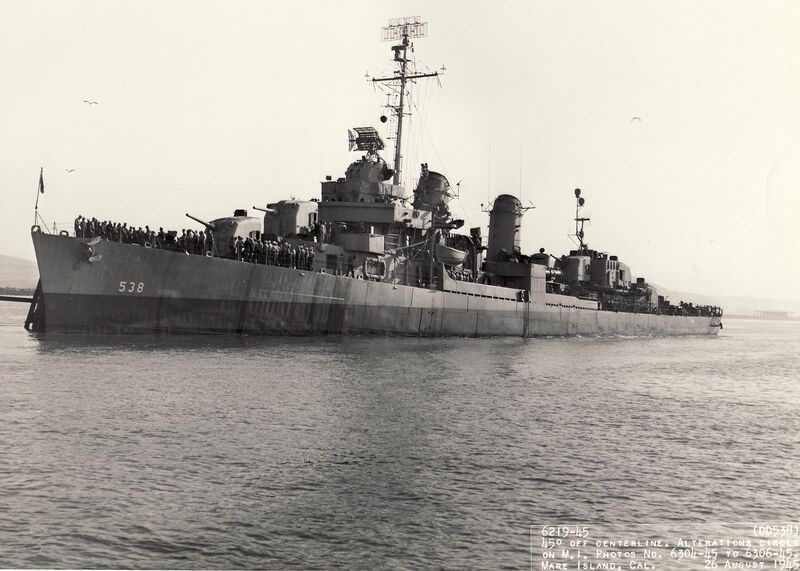 USS MORRISON (DD-560) on 1 February 1945 at HPNY at the end of her overhaul and repainting to Ms 22. 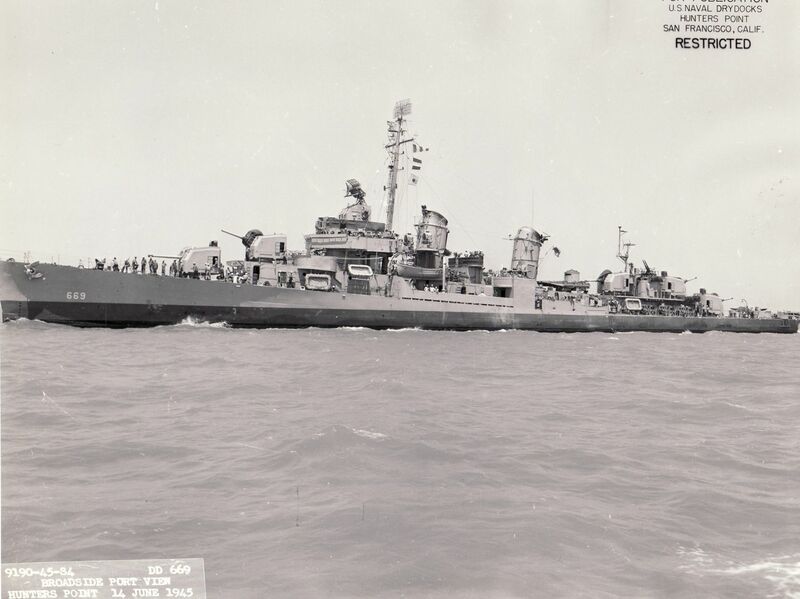 USS WADLEIGH (DD-689) on 10 April 1945 at MINY after she was overhauled/repaired and repainted to Ms 22. 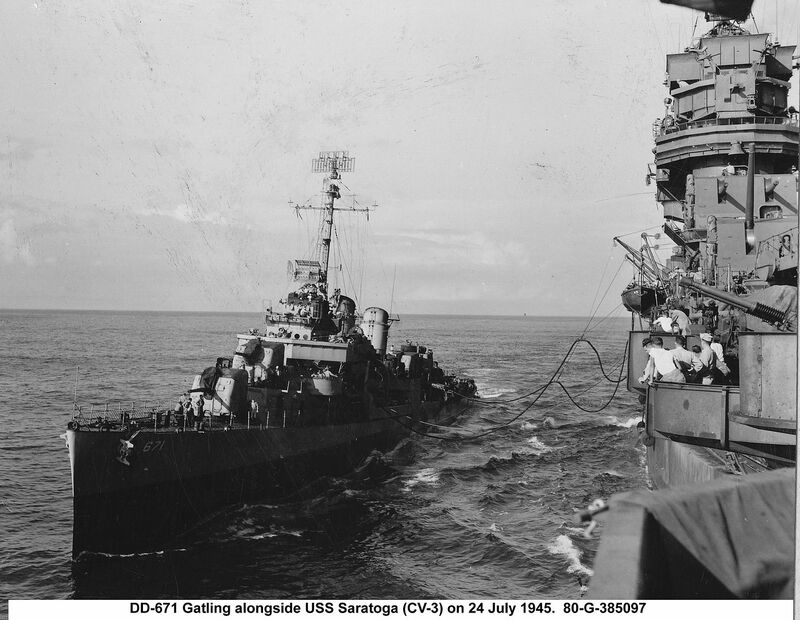 USS CAPERTON (DD-650) and USS COGSWELL (DD-651) in May 1945. 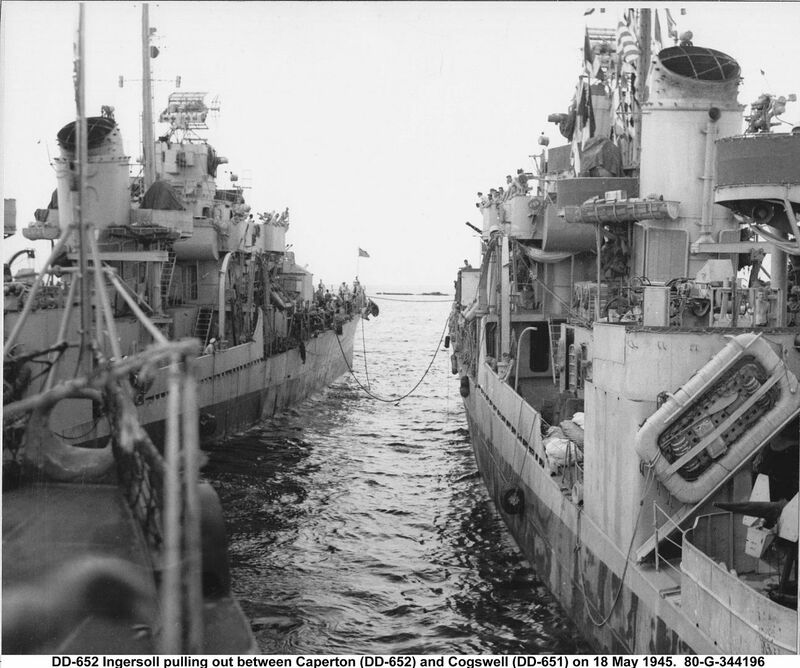 These two destroyers were overhauled and repainted in Ms 22 from 16 February to 3 April 1945, at Terminal Island D.D. (became Long Beach NSY) for USS COGSWELL and from Todd-San Pedro for USS CAPERTON. USS GATLING (DD-671) at MINY in June 1945 when she was overhauled, upgraded to the Anti-Kamikaze Mod, and repainted into Ms 22 camo. USS MILLER (DD-535) at MINY on 24 August 1945 after her overhaul and repainting into Ms 22. USS STEPHEN POTTER (DD-538) at MINY in August 1945. 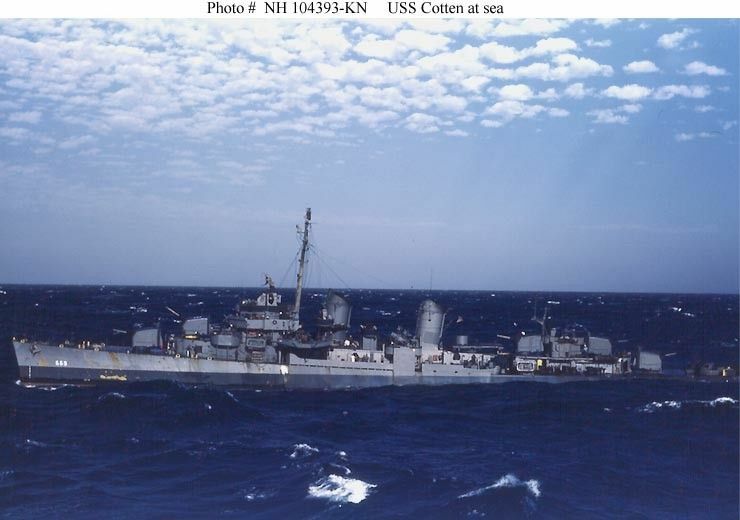 In another case of having a color image of a ship and a B&W image at "about" the same time frame, here is USS COTTEN (DD-669). The color image is thanks to NHHC and was taken as she was escorting a troop ship convoy to the war zone shortly before the war ended, likely in late July or early August. This image, one of a series, was taken by an officer on one of the troopships with his personal 35-mm camera. The B&W image was taken on 14 June 1945 after completing her overhaul and upgrade at HPNY. Compare these images to each other and from Mr Potter's criteria, decide which images show 5-H Haze Gray or #27 Haze Gray ... even if two photos taken on the same day show different contrasts. Let me know, because I sure can't tell when the "transition" from Blue-Purple paints to Neutral grays happened. I finally got around to posting some low-priority documents that have a little bearing on this case. The main point is that ships weren't allowed to carry paint in 1945. The Commander of Battleship Squadron One requests permission to carry paint in June of 1945, referencing "Pacific Fleet Memorandum 5H-43 (Revised)" in the first sentence. I don't have a copy of this memo (yet?) so I don't know the precise date, however the last two digits in the Pacific Fleet memos is always the year it was issued, so the original release date was some time in 1943. The "(revised)" muddles things, but I also have this document from May of 1943 also states "No paint shall be carried in ships of the Pacific Fleet while at sea," in paragraph 5. So, we know this was a long-standing policy for at least two years. The Fleet Maintenance Officer for the Pacific Fleet forwards the request to CinCPac a month later but does not agree with the request. 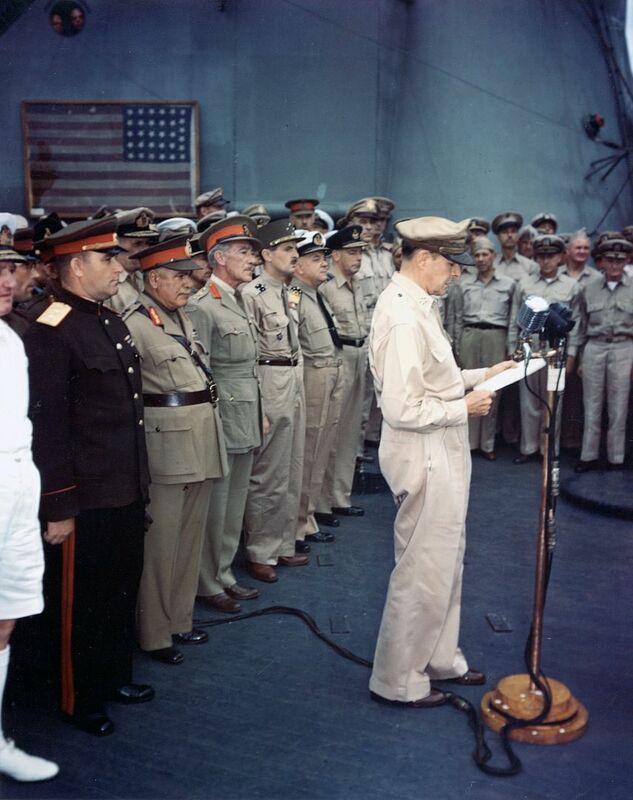 After the war is over the Commander of Battleship Squadron Two makes the request again and references the same PacFlt Memo 5H-43, indicating it was still in effect. So, ships wouldn't have been able to repaint while under way. It would have only been done at anchorage or while under availability.